sock monkey tree fabric ornaments created by nova68. complete set of 2 ornaments - 1 of each style. sock monkeys are handmade with cotton in classic brown and beige color tones. each ornaments is hand crafted and features unique details with artsy charm. they are ready to decorate your tree and hang from matching red fabric cord loops. unique and highly decorative; hang the festive sock monkeys from christmas tree, wall or mantel. each sock monkey measures about 8 inches in height. makes a cheerful and stylish display on any tree. looking for our classic sock monkey tree fabric ornaments? 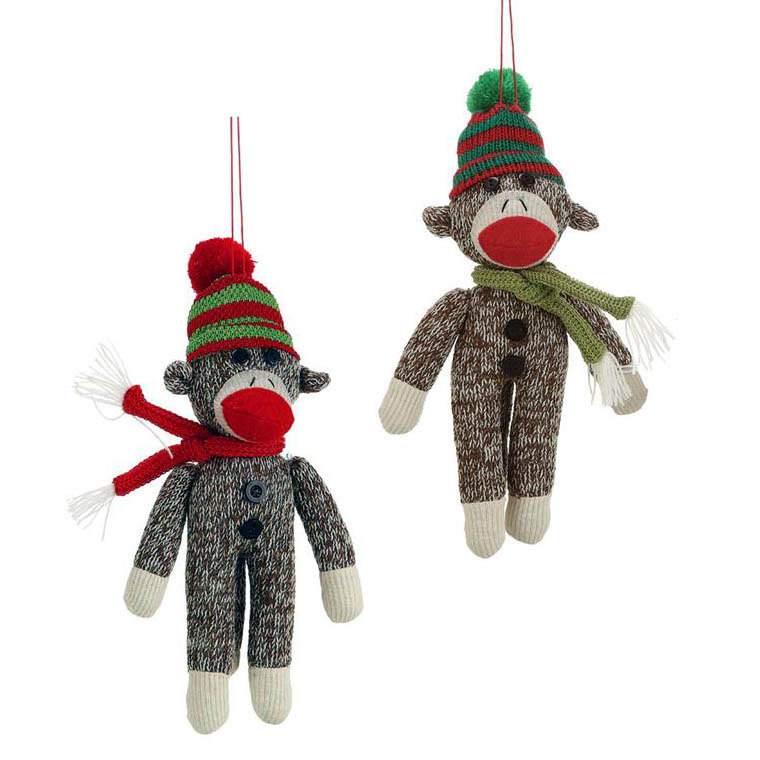 love to dress up your tree with these modern yet classy sock monkey-theme ornaments? these stuffed animals are a mixture of folk art and crafts in the cultural history of the usa since the 1940s and 1950s. inspired by traditonal sock monkeys from yesteryear; we fashioned these ornaments to have a cute-as-a-button elegance. at first sight; they look light regular sock-monkeys but they are actually made to hang from your christmas tree! designed and crafted by hand, each ornament is fashioned from natural fabric and sports a scarf and hat for a stylish and festive holiday look. price is for a set of 2 (two) ornaments! sock monkeys make great holiday gift ideas too!